CSI North Kerala Bishop Rt. Rev K P Kuruvilla, Treasurer Rt. Rev B N Fenn, former chairman of the Trissur All Saints Pastorate committee Rt Rev Thomas Kora, Mr. Peter M John, and Mr. Edward John, Former secretary and treasurer respectively are accused of cheating, misappropriation of trust funds, breach of trust, protecting and shielding the accused etc. 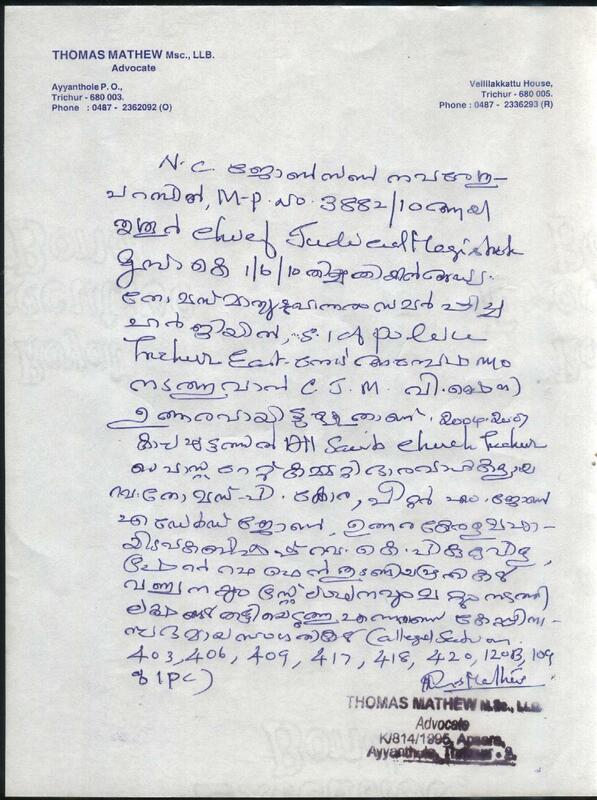 Mr. N C Johnson, Nareshuparambil, former pastorate committee secretary (1984 - 1988) has filed a petition NB no. 3882/2010 in Honorable court of chief judicial Magistrate , Trissur on 1-6-2010 through advocate Thomas Mathew. Honorable Chief judicial Magistrate Smt. V Shiny has ordered the Trissur East Police to investigate and report to the court. Above mentioned accused by misappropriation, breach of trust and fraud, has cheated the faithfuls of the church of in the period of 2005 -2008 besides trying to protect and shield the accused. alleged sections are 403,406,409,417,418,420,120B,109 of Indian Penal code.